Delve into Russia’s rich history and Orthodox religion on a private 10-hour trip to Veliky Novgorod from St. Petersburg. One of Russia’s most important historical cities, UNESCO-protected Novogord is filled with well-preserved medieval churches and landmarks. Visit the walled Kremlin, multi-domed St. Sophia Cathedral, fresco-painted churches and more, and see the traditional, nail-less wooden buildings on show at the open-air Wooden Architecture Museum. Private transport, hotel pickup and drop-off, and lunch included. After hotel pickup from St. Petersburg, head south from the city with your private guide and driver. Travel through picturesque countryside on route to Veliky Novgorod, also called Novgorod, Novgorod Veliky or Novgorod the Great. Learn how the city is one of Russia’s most important historically, and the cradle of Russia’s Orthodox religion. Straddling the River Volkhov, it once stood on a trade route between Asia and Northern Europe, and became Russia’s first capital in the 9th century. After about 2.5 hours, arrive and admire the churches and medieval monuments as your guide sheds light on their history. Head for the Novgorod Kremlin, the 15th-century fortress overlooking the river. View the red-stone walls, and go inside to visit St Sophia's Cathedral, one of Russia’s best-preserved churches. Built in the 11th century, this stunning building is graced with five domes and 12th-century frescoes. Study the artworks, and then wander to the nearby Millennium of Russia monument, built in 1862 to commemorate Russian statehood. Leaving the Kremlin, visit the Church of the Savior, a stunningly simple church painted with 14th-century frescoes by Theophanes the Greek. Stroll around the marketplace, and savor a delicious Russian lunch in a local restaurant. 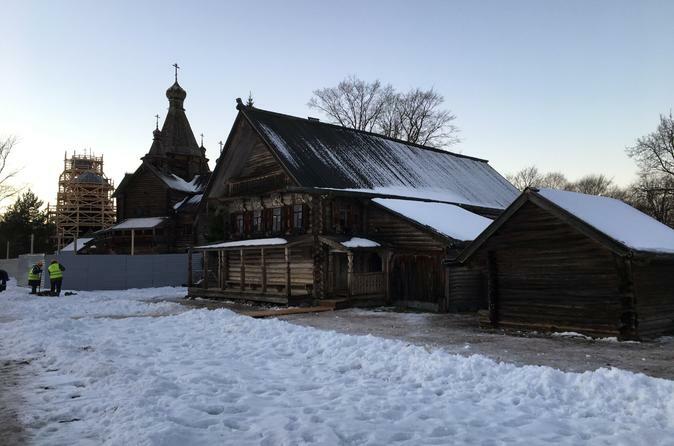 Then, after seeing the riverbank Church of St. George, explore the Museum of Wooden Russian Architecture. Follow the pathways around this open-air museum, viewing the reassembled old wooden buildings made without nails. Admire the churches and other structures, and explore the izbas (houses) for insight into the lives of Russian peasants of yesteryear. If you wish, arrange with your guide to include a talk with a Russian Orthodox priest during your trip. Enjoy a private meeting with Father Dmitry of the 12th-century Nativity Church to learn first hand about today’s Orthodox ways. Your tour then ends with a hotel drop-off in St. Petersburg. Novgorod is beautiful in the winter and our guide Elena was very professional and informative. She drove us herself in her new car which was very comfortable. 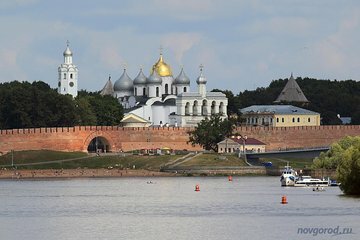 If you have a day to spend, please visit Novgorod in a private tour like this one. We walked around without feeling rushed and visited unrestored churches. Elena suggested a nice usbek restaurant for lunch. After lunch, we visited a small monastery and spoke to her friend Father Dimitri, which is quite different from other tours. Our guide Elena was fabulous. You could ask her a question about anything in Russia or St. Petersburg and their history and she would have an in-depth answer. She went above and beyond on the tour to make it an interesting, rewarding and enjoyable experience for everyone. Stunning trip to Novgorod. Grateful we did this journey to medieval setting of Novgorod. Recommend to spend a day there during a Saint Petersburg. Fantastic tour guide Elena provided us with all the context and stories around the history of the place as a Hansestadt.